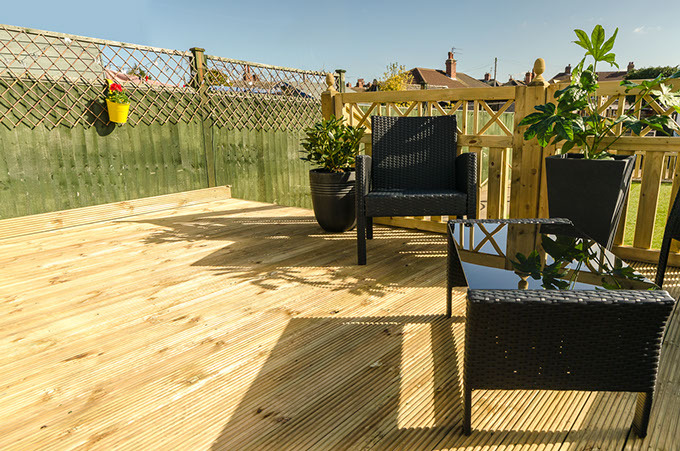 Creative Gardens are professional timber decking installers in Grimsby and throughout Lincolnshire. Our decking solutions can be used inside for summer houses or saunas and outside to create a usable terrace you can enjoy all year round. Decking can offer many advantages over hard landscaping. In addition to the obvious aesthetic potential for a natural product in the garden, decking is a very cost-effective solution to extending your home outdoors. It also provides a simple and easy to install solution for changes in level, with minimal wet construction and site excavation and can be easily modified or extended at a later date. The fantastic feature of decking is that it can suit every contour and position of your garden and with the right lighting you can turn that unused boring slope in your garden into an amazing location for romance, relaxation or parties. All timber deck construction conforms to local authority regulations. Our traditional, classic and contemporary Decking designs give you more possibilities than you’d ever imagine – even if on a tight budget.